Want a "Pick-me-up"? 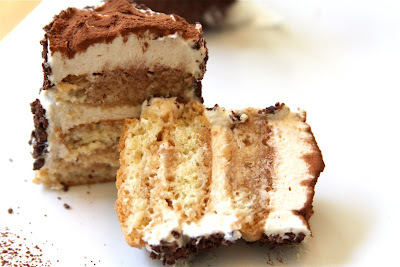 How 'bout a semi-freddo (freezer-cold without being frozen) cake made with the richest of Italian cream cheese (Mascarpone), and a rich Italian sauce (Zabaglione) covering sweet sponge cookies (Savoiardi) that have been (hello?) soaked in dark ESPRESSO!?! 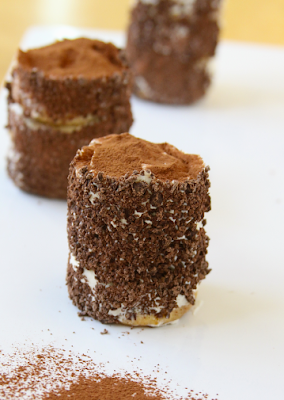 That's the classic Italian dessert called TIRAMISU, which translated means: Pick me up. My twist on this classic was to infuse the pastry cream and soak the lady fingers in a hearty, cozy, spicy Chai Tea from Algabar Teas. I know, I know -- and it was--so, so delicious! For an Itali-phile like me, it wasn't very hard to get excited about this month's challenge. 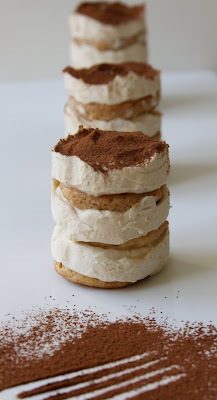 There are several stories about the history of Tiramisu, however it is generally considered to have been created in the town of Treviso in Northern Italy. The restaurant, Le Beccherie, claims it's origin and still proudly serves the classic version of this famous dessert. That version uses raw eggs in the pastry cream and dark bitter espresso soaked sponge cookies and smothered in deep dark powdered cocoa. Our Daring Baker hosts did an amazing job of laying out the challenge with links and pics to help us enjoy the process. 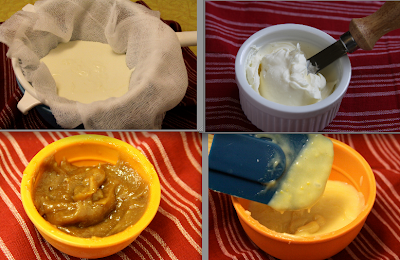 The process, by the way, included making our own home made MASCARPONE CHEESE. If you take nothing else from this post, PLEASE try making your own Mascarpone cheese. 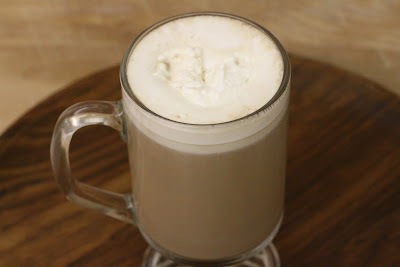 It could not be any easier (cream and lemon juice, that's it), and the taste and creaminess had me preaching it's glory to everyone I talked to for days. 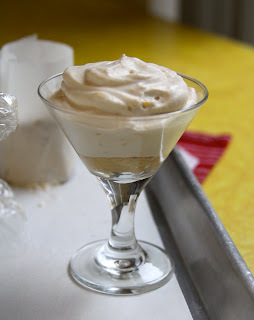 The classic recipe uses Zabaglione, which we made, but we also added a pastry cream and whipped cream to our mascarpone. This made a full bodied cloud of sweet and spiked pudding to surround our Home Made Savoiardi cakes. Once my cheese was made, my creams were chilling over night, and my sponge cookies were cooled, I carefully brewed my Kyber Pass Chai Tea. Then I soaked my lady fingers in the Chai tea for a few moments on each side and experimented with several designs for my finished dessert. 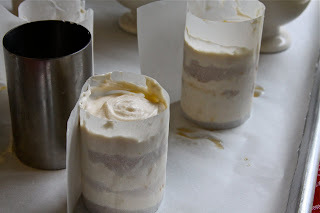 Here: I placed plastic wrap inside a dessert cup and lined it with the cakes, then filled it with the cream, another cake, and finished with cream. I wrapped the tops and held these in the freezer overnight. I gently pulled the form out, unwrapped and set up to complete with sifted cocoa the next day. 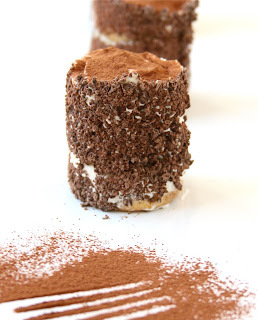 *You can hold Tiramisu in the freezer for several days, just leave out for a few minutes at room temp before serving. OR: Added Grated Chocolate because..well..there's never enough chocolate for my taste! 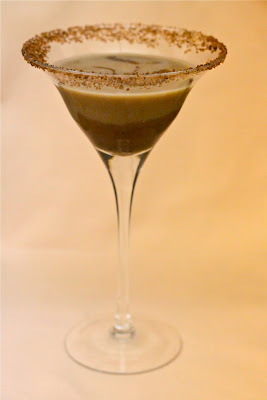 I also served the Chai Tea Tiramisu (layered cookie, cream, etc.) in a cordial glass as a completed dessert, after chilling. If you're reading this and thinking about making this (first of all, YAY!, but also), don't get thrown by the ingredients or length of the material. Read it over like a story, sit down with a pen and paper and map out your plan of attack. 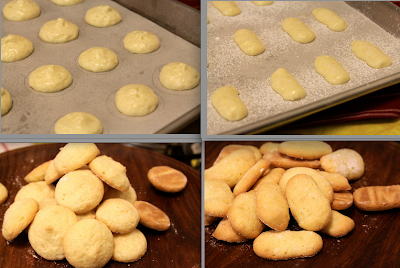 There are easier recipes, but this was very fun and the process was very therapeutic. If this is not new to you at all; I highly recommend these recipes, too. 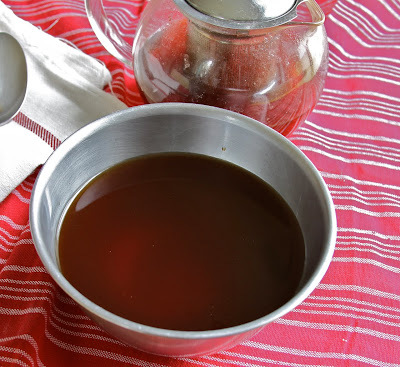 In a large mixing bowl (or stainless steel mixing bowl), mix together the egg yolks, sugar, the Marsala (or espresso/ coffee: I used Chai tea plus 1 TBLS. Port), vanilla extract and lemon zest. Whisk together until the yolks are fully blended and the mixture looks smooth. 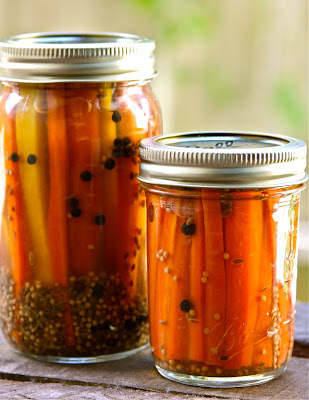 Moroccan Pickled Carrots - Oh snap! Pickles aren't something I think of often. Yet, when good ones are served with a meal, or just put out on a plate on the table, I'm the first one to munch them down to their tiny little pickled stems. Pickles are the accent, that perfect piece of jewelry that brings the rest of the whole look together. February's ingredient for TigressCanJam is carrots, chosen by Doris and Jilly. Since I make jams a lot, I thought I'd spice it up a bit and can some pickles. Spice is a good word to use for these tongue trippers. I was inspired by one of my favorite books: Jam It, Pickle It, Cure It by Karen Solomon. The colors in her photos and the simplicity of her recipes give you the confidence to use them, yet leave room for experimentation. 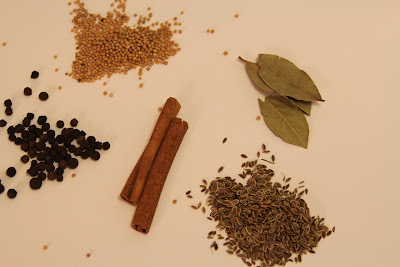 Besides the spices (seen below), I also added Cumin and a pinch of tumeric. 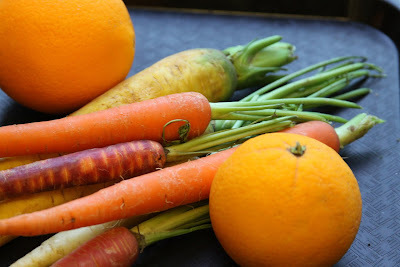 I had a blast picking out multi-colored Heritage Carrots and Oranges at the Hermosa Beach Farmer's market. 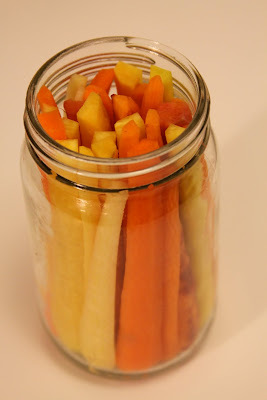 After sterilizing the jars, I packed the peeled, and sliced carrots into the jars, added my spices and filled them with a concoction of acid and citrus. This was a fun can/pickle session and I'm thinking of giving these as gifts to my friends who just aren't the sugar/jam/jelly types. These have crunch with a collection of sweet citrus, lively dill and mustard, and earthy cumin. 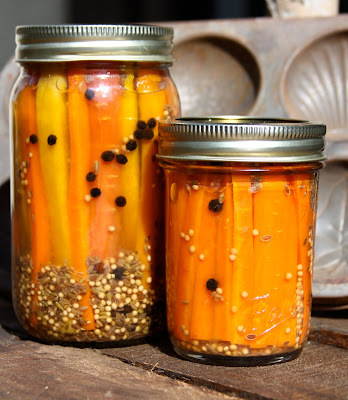 I think I just made myself want to go pull another carrot out of the pickle jar. What would you make with Prawns, Sweet Peppers, Fennel and the theme of Passion? Several extremely creative folks answered that question and generously gave us their recipes and how-to's. I am fortunate enough to have the difficult job, this month, of choosing a Paper Chef #49 winner. I'm really sincere when I say this: There is not a clunker in the bunch. These dishes could be their own site. I hope you'll bookmark this round-up and use it over and over! Now, even though I'm not eligible for the challenge, I still wanted to play along, so I made a dish, too. I hope it's worthy to be with these other phenoms. 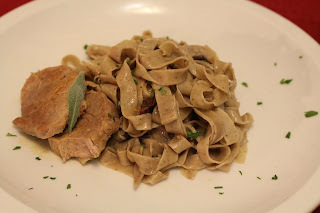 I have a PASSION for all things Italian, so I challenged myself to use the Paper Chef ingredients with other classic Italian ingredients and add a modern presentation to them. The PRAWNS/White Tiger Shrimp were simply broiled after being drizzled with Balsamic Vinegar, Fiorano Olive Oil, salt and pepper. Heat the stock and the peppers in a sauce pan til simmering. Sprinkle in the Polenta, a little at a time, stirring constantly to avoid clumping. Cook on low for about 15 minutes or until creamy. Take off the heat and stir in butter, salt and pepper to taste. Place an oiled circle mold on the plate and fill half way up with Polenta. Remove circle. On top of polenta, place a Tbls. of Fennel & Shallot jam. Press 1-2 shrimp into the center of the jam and serve. Using his passion for the grill, Bill made "Mothership Wit Superbowl Skewers". The picture of the beer made me want to reach up and grab/drink it. 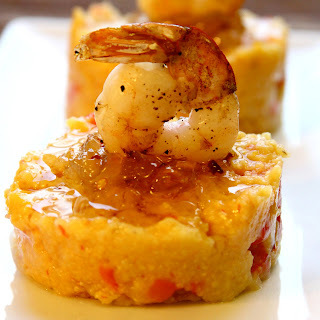 The marinaded shrimp sound delicious! His passion for cooking is contagious and a fun name for his blog. Prospect: The Pantry created a cozy, inviting Seafood Pot-pie with Fennel and Peppers, even though she was snowed in (which played well into her passion that included resourcefulness and making the most of all things). 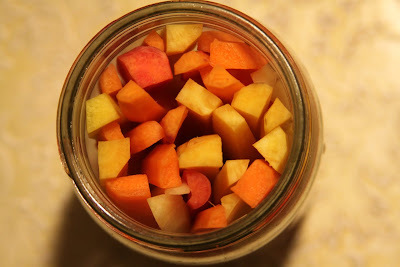 I Could Even Eat a Baby Deer has a really fun spirited post and a recipe for a Prawn Burger and Pineapple Salsa that looks very flavorful. Always a nice read, here, too. 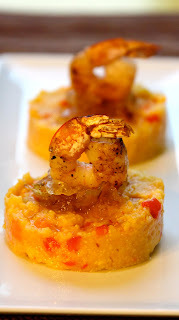 Lucullian Delights created a beautiful dish of Grappa and Fennel seed infused Prawns on a bed of Chickpea Puree. As always, her pictures are amazing too. Ilva is the gracious and talented co-host of Paper Chef and we newbies are so thankful that she continues this fun food event. Culinary Annotations has a colorful and hunger-provoking dish of Italian inspired Prawns and a burst of Cognac is introduced. I'm drooling just typing about it. I particularly loved the information that is shared in the post, also. Spikey Mikey's wrapped these ingredients up in a Rice Paper wrapper where the stripes of the red pepper showing through are such a fun presentation. This also sounds like a dish you would eat and feel good about what you just did for your body. Mike is also a Co-host and has been extremely patient with my many questions. I'm sure it's no coincidence that this is such a long running challenge AND the two hosts are so passionate and generous. Great job, and I'll be visiting all these blogs over and over! If you're like me: one of those people who can't answer any question that starts with, "What is your one and only favorite...? ", then you will love MEZZE. 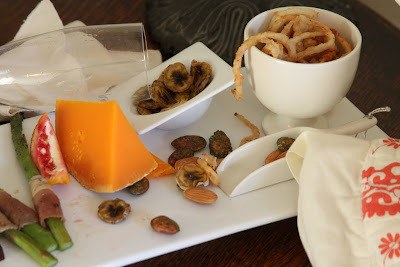 It's a way of eating, it's a bunch of different tidbits of flavor, it's a party on a platter! The word, Mezze, is used in Middle Eastern dining, and usually comes before a larger meal like: Appetizers, Tapas, Dim Sum, Hors d'Oeuvres and Antipasti. There could be as many as 50 different small servings that make up a Mezze course - or just a couple. 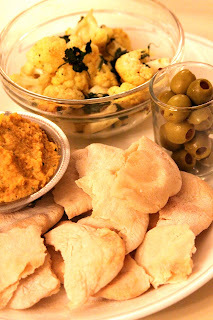 Very often it will include Pita Bread and Hummus. "Mezze" has become a sort of trendy term to use in restaurant names across the country in the last few years, too. I was visiting my Mom, Brother, and his wife in North Carolina when I made my Mezze platter for this challenge. We got snowed in for 3 days and luckily I had already bought all the ingredients. 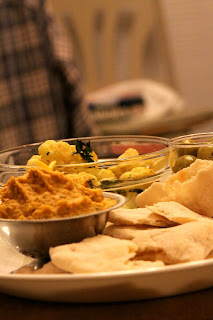 Having mezze was a perfect way to sit around, chat, graze,watch the snow fall, laugh, eat some more, play a board game, and nibble some more. The lighting was not so great for photos inside, but you get the feel: cozy, golden and casual. 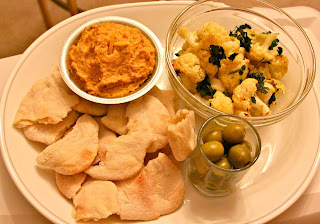 The Pita recipe is easy, the hummus couldn't be quicker, and the cauliflower takes no time at all. The olives I had added to some spiced up olive oil earlier in the day, so we never missed a beat chattering away even while I was putting the Mezze platter together. 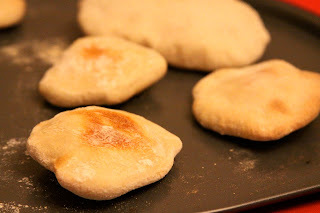 There are a gazillion recipes online for different Mezze and even a helpful YouTube video on making Pita right here. Quote from my Brother - (with a mouthful of Pita and hummus, giving me a big OKAY sign, then..) "Is there garlic in this, I mean it's the perfect amount, seriously good." Wash and trim Cauliflower. Place buds in a single layer on a baking sheet. Sprinkle Salt and Pepper, then drizzle with Olive Oil. Place in oven preheated to 350F for 15 minutes. Sprinkle with your favorite Curry or Curry blend and squeeze a fresh lemon over the pan of curry. Toss gently and continue to cook for about 10 more minutes. 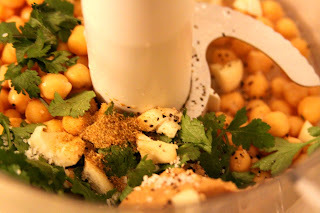 *Optionally, toss in a few sprigs of fresh cilantro in the last 10 minutes. What would YOU add to this? Got a favorite one? I also LOVE the eggplant spreads. Is there any doubt that food and sexuality are partners in life? One viewing of the movie, THE BIG NIGHT, would convince you of that. 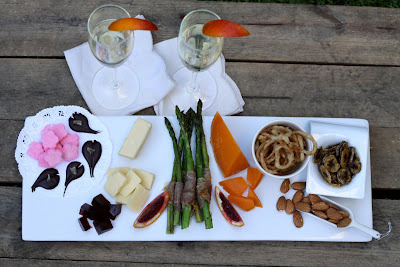 For this month’s Let’s Lunch Bunch, our theme is APHRODISIACS. Being a lover of variety, mood and narrative, I used several acclaimed Aphrodisiacs, including LOCATION. 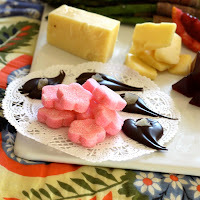 When thinking about Aphrodisiacs, the first thing that popped up in my mind was CHOCOLATE (maybe not the first thought, but the first “food” thought.) Since chocolate is a daily addiction of mine, I wanted to go a little further. I considered OYSTERS. If I’m honest, I only considered them for a moment. Then I did a little research into the history, medical and fantasy background of Aphrodisiacs. It seems the reoccurring theme with a lot of the recipes that purported to have success read a lot like this: A little of this, a little of that, then…POUR IN THE TEQUILA. The more medically inclined articles listed herbs and barks, and VIAGRA. Since some of those were a little harder to find and even harder to turn into enticing pictures (no offense to the charming Viagra commercials), I continued my journey. Another route for “aphrodisiacs in food” seemed to be the shape, and the psychological suggestion that if we SEE something, that LOOKS even a little bit like a sexual organ, it stimulates our desire to…to…engage with such (just trying to keep it clean, folks.) Therefore: asparagus, bananas, peaches, long twisty sweet…uh..Licorice sticks were included. Lastly, there were opinions that the only real honest aphrodisiacs come in the form of foods that increase our health, immunity and well-being. Nutritious energizers like: almonds, green tea, quinoa, and bananas (aren’t they popular?). I can understand the logic regarding the “healthy” tantalizers. I mean, if you don’t feel good or have the energy to even stay awake, how are you going to do much else, right? Thus, the “yes, if you don’t mind that I just lay here” kinda evenings. You know what I’m talking about, Ladies. With all these thoughts and imaginations stirring inside me, I figured why not a whole mixed tray of healthy, inhibition lifting and visually stimulating food? And while we’re at it, let’s just save time (it’s lunch hours, remember) and take it to the bedroom. 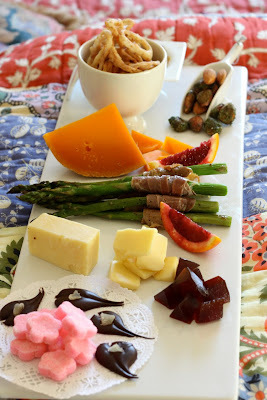 My real advice: make these nibbles the night before, either stay in bed all morning or meet your “intended” at home for a delicious surprise lunch meeting. Cheeses: Your choice, but here I have a Mimolet and a Compte. Banana Chips: Slice Banana onto a sprayed pan, heat for about 2 hours at 200F. Turn once or twice during the drying heat. 1 tsp. Matcha Green tea powder, 1 Tbls. sugar. 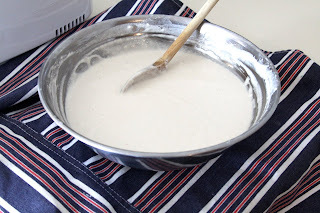 Whisk the egg white in a small bowl. Add the almonds in and coat thoroughly. Mix the Matcha and sugar together and sprinkle over the almonds. Toss to coat. Spread the almonds out in a single layer on a sheet pan. Bake on 200 for 40 minutes. Turn over half way through. Separate the Shallot rings and soak them in a cup of Buttermilk for at least 30 minutes. Drain and toss in salt and pepper seasoned flour. Using tongs will help the rings stay separate and not clumped together. In a deep saucepan, bring vegetable oil to 325F and fry small batches of shallots at a time til lightly browned. Drain on Paper towels before plating. Toss the Asparagus in a bit of Olive oil just to coat, then wrap a piece of prosciutto around the bottom third of each stem. Sprinkle with pepper and salt to taste, but remember that prosciutto is already a bit salty. On a sheet pan, place the Asparagus with the loose end of prosciutto facing down. Bake in oven at 375F for about 12 minutes. Turn at least once during cooking. Melt chocolate slowly in a microwave or over a double boiler. Spoon out round dollops onto a parchment cover sheet pan or silpat. Drop a couple tiny pieces of ginger onto the chocolate. Using a toothpick or skewer, drag the tip from just above the round dollop, through the center and out the bottom. Lift the skewer. As the melted chocolate moves back together just a bit, this should leave a heart-shape with a quill-like tail. Chill for just a few minutes to set the chocolate, and then remove from the pan. Happy Valentine's Day and I hope everyday is an aphrodisiac for you! Oh Mama, don't you love Umami? That's the earthy warm 5th taste that shows up, even in the air, when you heat up mushrooms. 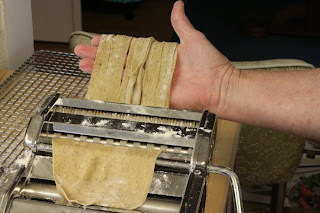 When you add that flavor to the dough for handmade pasta - - - Che buono! I love being a multi-tasker so I'm constantly looking for ways to add to, double up, and extend things. One of my very favorite things to make is flavored pasta. Being able get some of my "vitamins from vegetables" while practicing my "addiction to carbs" just makes me smile. I've made Dandelion Pasta, Roasted Red Pepper Pasta, Chocolate Pasta, you name it. 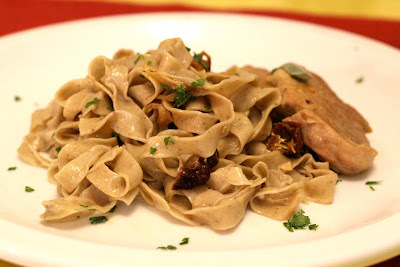 And this Mushroom Pasta Dough is one of my favs. It's very simple and the only real work comes in the kneading, which is so important. I really enjoy the feel of dough and kneading is like therapy, but a lot cheaper. I'll warn you; While showing the steps to this process there's no way to make a mound of mushroom paste look pretty, but it's a lot like pate at that point. 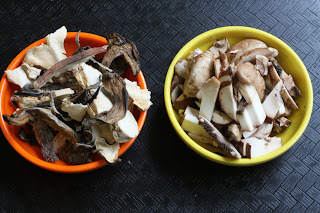 Start with 1/2 cup of Dried Wild Mushrooms and 1/2 cup sliced Baby Bellas. Cover the Dried Mushrooms with a cup of boiling water, to reconstitute them. Drain them and reserve the mushroom water for later. Saute the mushrooms on Med/High in a small amount of Olive oil for just a few minutes to bring out the juices. Let cool, then add the mushrooms from the pan to a blender with 2 eggs. Puree to a smooth paste. On a work board, make a mound of 2 cups of All Purpose Flour and 1 tsp of salt. 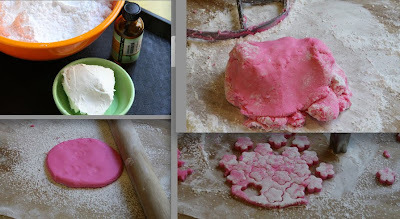 Make a well in the center of the flour and pour the mushroom paste into the well. 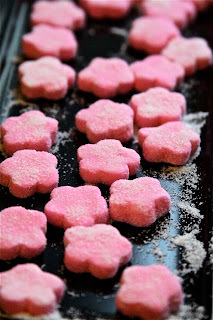 Gradually pull the flour from the sides into the mushroom paste, kneading as you go. When and if you need moisture, add a couple Tbls from the mushroom water that you reserved. Continue kneading the dough for about 10 minutes until you have a smooth, blister free dough that when pressed with your thumb returns quickly. Cover the dough and let rest for 20 minutes. Cut the dough into two parts and cover the half you're not working . 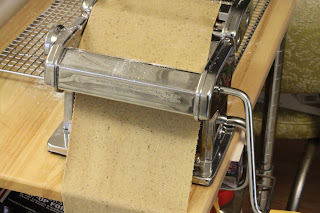 Press or roll out the first half until it's flat enough to be rolled through the widest setting on a pasta machine. Continue to roll the dough thinner through the machine, cutting sections as you go to make it manageable. 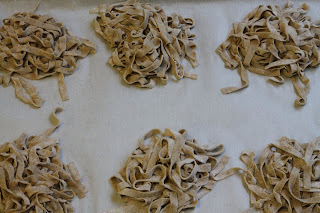 Roll the cut sections through the Fettuccine blades to create your Mushroom pasta. To hold the pasta for cooking, toss serving size amounts in a bit of flour and make mounds of them on a parchment covered baking pan. These can also be frozen, then bagged for later. Cook fresh pasta in salted boiling water until it floats to the top, or about 3 minutes. Drain and serve with your chosen sauce, optionally adding chopped sun-dried tomatoes, capers or olives. Ingredients: 1/2 cup Dried Mushrooms 1/2 cup Baby Bella or other button (sliced) 1 cup boiling water (for reconstituting dried mushrooms and reserve this) 2 Tbls. Olive oil 2 Large Eggs 2 cups All Purpose Flour salt/pepper to taste *Optional* Sun-dried tomatoes olives capers chopped parsley chopped fresh sage. Saute the Tenderloins in olive oil on Med/High just til browned and reserve. Turn down to Low/Med and add onions to the pan. Cook onions til caramelized, adding salt to taste. Deglaze pan (add in) white wine (or just a bit of stock if you don't want to use wine). Cook this til most of the moisture is gone, for about 5-10 minutes. 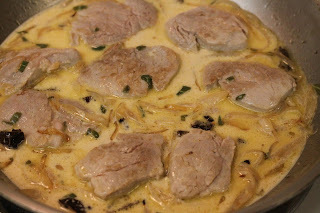 Put the Tenderloins back into the pan, add the stock and cream. Cover the pan and cook on Low for about 10 minutes. Add sage and turn up heat to reduce liquid by 1/3, about 3-5 minutes. Stir to make sure nothing sticks. The Pork Tenderloin is ready to serve. You can add the pasta into the pan, or serve separately over the pasta when ready. Garnish with chopped parsley. 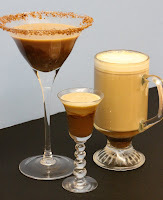 Nutella Cocktails (Three Ways) for WORLD NUTELLA DAY! "We are the worllllld, We love Nutella" Everybody sing! When it comes to drinks, I'm the "do you have something with fruit juice or sugar in it?" kinda gal, but my husband is a "Martini - Belvedere, straight up, dry, a little dirty with extra olives" kinda guy. I take a swig of his martini when I need to clear my sinuses. These Nutella spirits covered it all. 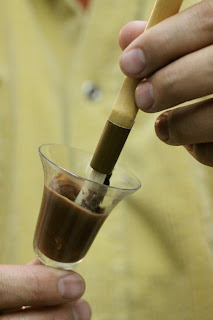 With a pastry brush, paint the Cordial glasses with Nutella (this can be done ahead of the party also). 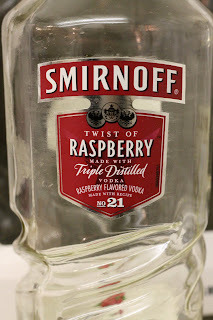 Then pour in a little raspberry vodka to taste. 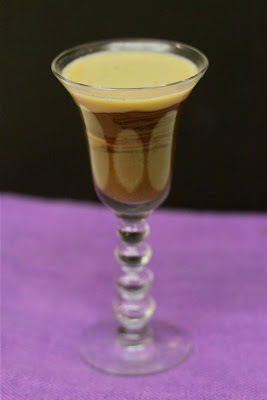 Lastly, pour in espresso to fill and drizzle with cream. Warm 1/2 cup Nutella and a shot of Frangelico in a saucepan on low, stirring until Nutella is melted and hold off the heat. Using a clean napkin, rub the rim of the Martini glass with water. Then dip the edges of the glass into a shallow bowl with a half and half mixture of crystal sugar and grated chocolate. 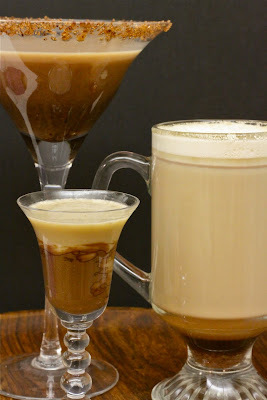 With the glass upright, carefully pour in a shot of the Nutella syrup, followed by 3 shots of Vanilla Stoli that has been "shaken over ice". Tomorrow, you can return to making Nutella ice cream and crepes, but for one night -- The Nutella is all ours...and the world's! Happy World Nutella Day! Quote from my husband,"I really like being your taste-tester today!" Ms Adventures In Italy and Bleeding Espresso, and I'm thankful! PAPER CHEF #49 - Love These Ingredients!